The future of water is quite daunting. Based on current consumption rates, in just six years, two-thirds of the world’s population may face water shortages, according to the World Wildlife Fund. It is crucial facilities incorporate new technologies for water reuse. IDE Technologies has developed Pulse Flow Reverse Osmosis (PFRO) for wastewater effluent reuse. This process provides safe, high-quality and cost-effective water that can be used in a water reuse facility. Current wastewater desalination technology is based on three primary processes: ultrafiltration or microfiltration pretreatment, standard multi-stage reverse osmosis (RO) and ultraviolet (UV) or advanced oxidation provess (AOP). This process generates end-product water that meets the strictest definition for water reuse. Chloramine is dosed during the process to control biofouling. Although chloramine can protect the RO membrane from biofouling to a certain extent, it also has less desirable side effects. Chloramine initiates the formation of disinfection byproducts such as N-nitrosodimethylamine, which is a toxic compound and a suspected human carcinogen. Further, when chloramine reaches the UV or AOP process, it diminishes the UV transparency, causing a 30% increase in power consumption and requires a larger facility. Operating expenses and capital expenses of the UV/AOP unit are reduced with the elimination of the use of chloramine, providing an additional advantage to the system. For more than 50 years, the traditional RO process has been based on a constant, fixed and unchanging current of brine flow during the entire operation time of a water plant. In RO-based water reuse facilities, membranes are arranged in two or three stages to keep a minimum brine flow­—usually 3.5 cu meters per hour—in the last element in order to maintain the minimum cross flow velocity required to keep the membranes clean. This multi-stage arrangement allows maintaining minimum flow velocity, but results in energy losses and greater structural complexity. As such, with conventional RO, there is a contradiction between the desire to reduce the brine flow to reach high recovery, and the need to evacuate the concentrated solute ions and fouling particles by maximum shearing velocity. Fouling only can be evacuated effectively by high brine flow velocity. In the traditional RO multi-stage approach, the brine flow and the solute concentration in each stage are constant, creating ideal conditions for scale formation so more energy is needed to clean the membranes continually. Other operational limitations of the conventional RO design include limited recovery and high differential pressure in each stage. Further, capital expenses are higher due to the need to have more membranes and pressure vessels in the last stage. As a result of the lower fluxes, there is more complex multi-stage piping and additional interstage booster pumps. Unlike the conventional staging RO train approach, PFRO is a single-stage RO train structure with all the pressure vessels operating in parallel. In this configuration, the PFRO train continuously receives feed flow from the high-pressure pump and continuously produces permeate, however, it discharges brine flow periodically in a pulse flow process. PFRO operation consists of two cycles: production cycle and flush cycle. During the production cycle, the RO membranes operates at 100% recovery and all pressure vessels in the train get feed flow in parallel. This results in significant energy savings by diminishing the pressure drop loss in the RO train (from feed side to brine side) to about 0.5 bar. The gauge pressure in the PFRO train during the production step is almost equal in all membranes, which results in more even flux in the first and last membranes of the pressure vessel. This allows a reduction in the total number of membranes and pressure vessels. Permeate and brine pressure strokes during flush cycle are synchronized in such a way that induce a short forward osmosis (FO) process to create the flow of permeate toward the feed side, so as to lift fouling. During the short period of flush cycle, the pressure drop increases to about 3.5 bar. In the conventional high-recovery three-stage RO train, the pressure drop in each stage usually is 1 to 2 bar, resulting in a total pressure drop of about 5 bar across the three stages. With PFRO, this is the main source of power saving. In the PFRO system, the contradiction between the desire for minimum brine flow and maximum velocity is solved as a smaller volume of brine flow is discharged at high velocity for a short time in the pulse brine discharge process. Pulses provide effective evacuation of the solute ions and fouling particles, and the membranes always operate within the limits specified by the manufacturer for flow per element and maximum pressure drop. A PFRO water reuse demonstration pilot is currently operating in Pismo Beach, Calif. The project is a partnership involving the cities of Pismo Beach, Arroyo Grande, Grover Beach, Oceano Community Services District, and the South San Luis Obispo County Sanitation District. As the community continues to face ongoing drought conditions, wastewater reuse is now being considered as a viable option to help recharge the region’s groundwater basin. 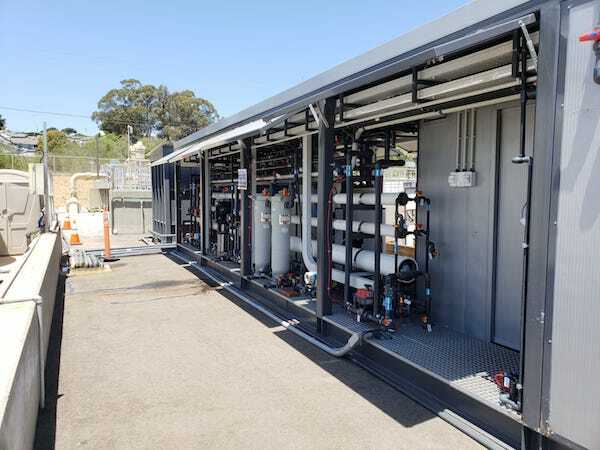 Pismo Beach began operating the Central Coast Blue Advanced Water Purification Demonstration Facility in spring 2018. The demo facility has a capacity of 58,000 gal of water per day and treats effluent from Pismo Beach’s Wastewater Treatment Plant, and subjects the wastewater to additional advanced treatment processes designed to achieve a finished product that is drinking water quality. The ultimate goal of the project is to inject the purified water into the groundwater basin for later extraction and potable reuse. However, no injection will occur at the pilot phase. Instead, the purified water is available for tour participants to try before it is returned to the Pismo Beach Wastewater Treatment Plant. The main goals in operating the demonstration facility include optimizing the treatment process and reducing energy and chemical use as much as possible. Early results show that there is 85% recovery using PFRO, and less brine requiring disposal. These results will help inform the design of the full-scale Advanced Water Purification Facility when construction begins in 2021. The full-scale facility is expected to provide sufficient water to meet approximately 30% of the municipal water demand and reduce the amount of treated wastewater discharged into the ocean by 77%. The wastewater desalination pilot in Herzliya, Israel has been in operation for six months now and is showing stable operating conditions. Early results from the pilot show 90% recovery, in a single RO stage, with six 8-in. membrane elements in a pressure vessel. The pilot is operated without the addition of chloramine, antiscalant or any other biocide. In the pretreatment phase, sand filtration of secondary effluent from a municipal water treatment plant is used without coagulant. The Silt Density Index was continuously above 6. With PFRO, unlike conventional RO operation, there are frequent and rapid changes in osmotic and gauge pressure. Bacteria becomes a problem for the RO process only when the biofilm is well developed. However, with PFRO, fast and frequent changes in gauge and osmotic pressure require the bacteria to exert energy on adaptation, leaving them with insufficient energy for reproduction, and the generation of bio fouling. The leap of PFRO from unchanging current to pulse flow allows wastewater facilities to achieve significantly higher solute concentration in the brine flow, and results in higher recovery rates. There is reduced power consumption due to non-continuous brine pumping, and the pressure drops is diminished in the stages. When considering capital expenses for a facility, PFRO reduces the number of pressure vessels and membranes as pressure is more equally distributed between membranes. This technology will be important as we develop a continuous supply of water using recycled water.